This is a must see beautiful 1338 sq. 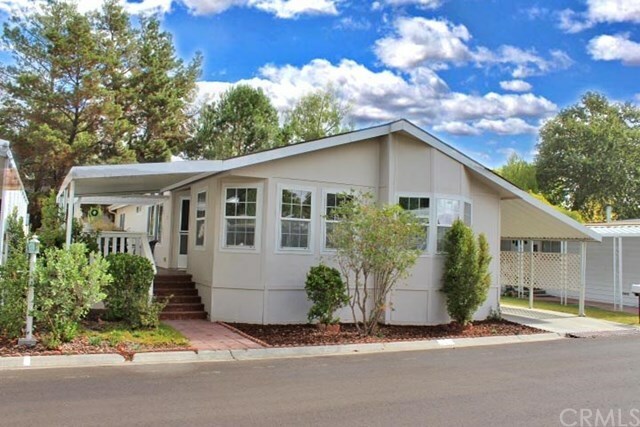 ft. manufactured home ideally located in southern Atascadero. The interior features 3 bedrooms,2 baths, an open floor plan with lots of light throughout. The design includes impressive vaulted ceilings, adding to the open feeling between the living room, kitchen and dining area all of which is easily extended out to a large covered deck for additional living space. Separate from the main living space is the large master suite with large closet and well equipped bathroom. There you will find two separate vanities, a large soaking tub a separate shower enclosure and lots of storage. Back up the hallway toward the living room are two guest bedrooms and a good sized guest bathroom. Also, there are ski lights and ceiling fans. The town of Atascadero is just a few miles north on the El Camino Real. There is always something happening in town, its a great place to live. There's not only lots to do but very good shopping and it's not far from San Luis Obispo. In the immediate nearby neighborhood there is a public golf course and city park. The Rancho del Bordo active adult community provides many activities at the community center and swimming pool area. All this is a short walk from the home. Currently the space rental, which includes the water, sewer and garbage fees, is set at $850. Check out the large assortment of photos provided in this listing. Directions: Hwy 101 to Santa Rosa, south to 10025 El Camino Real before you reach the Atascadero State Hospital.